Busy busy busy busy bzzzzz. That’s how I’ve been feeling lately. Juggling work deadlines and freelance projects, yoga class and happy hour, dinners with friends and family. Feeling busy can be overwhelming at times, but I feel unusually energized by my full calendar. I’d guess that the spring in my step comes from connecting with a few more friends in this new city. It’s nice to feel more connected with the community at large. This recipe exemplifies how I eat when I’m busy, or really, how I eat all the time. I’m generally only feeding myself, so it’s hard to justify pulling out all the stops for every meal. I like to keep a big bowl of leftovers in the fridge and find that I’m only motivated to cook again once I’ve emptied it. It begs mentioning that I’ve consumed almost every serving of every recipe on this blog. In other words, these are dishes that I’ve tasted for days in a row and believe are worthy of being cooked in your kitchen. The idea for this recipe came to me when I was dining at Masu Sushi & Robata in Minneapolis. My friend Grace ordered an appetizer of sliced cucumbers smothered in a delicious sesame-ginger sauce. They paired wonderfully together. 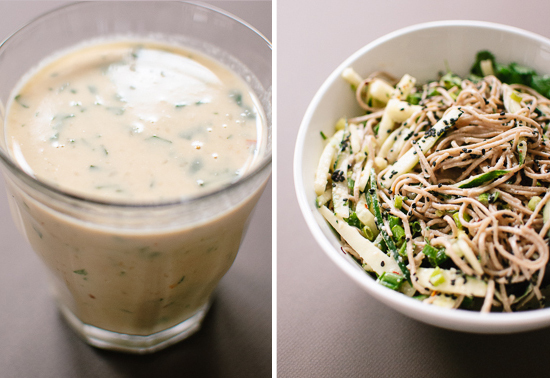 As I was ordering my soba noodles, I wondered why I hadn’t tried mixing ginger into my favorite tahini dressing recipe, and this recipe was born. This recipe is a flexible one and I’ve left room in the instructions for you to adjust it to taste. Feel free to toss in additional vegetables, like carrot ribbons (sliced with a vegetable peeler), chopped bell pepper or whatever strikes your fancy. If you love the creamy sauce, you might also like this peanut soba noodle bowl. 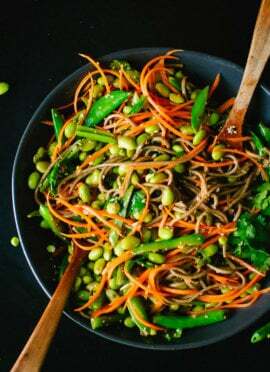 If you prefer a lighter sauce, try my colorful soba noodle & raw veggie salad. It’s a popular one that would go over well at a fourth of July potluck. 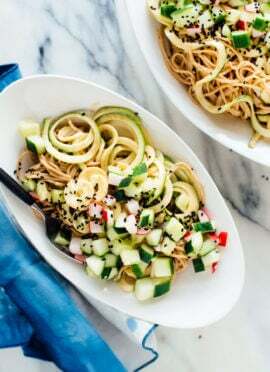 Soba noodles tossed with cucumber, scallions and a light yet creamy sesame-ginger-tahini sauce. This would be a great vegan potluck dish, but note that it is best when served promptly, as the salt will draw out the water from the cucumbers and dilute the flavors. It can be gluten-free if you buy gluten-free soba noodles, soy sauce and miso. Bring a large pot of salted water to boil and cook the soba noodles until al dente, according to package directions (do not overcook them!). Drain and rinse under cold water. Use a chef’s knife, or better yet, a julienne peeler, to slice the cucumber into long, skinny strips. Toss the super seedy inside strips. Then you can slice the remainder into 3-inch long strips (as shown) or leave them long. In a small bowl, whisk together the tahini, rice vinegar, ginger, miso, tamari/soy sauce, sesame oil, cilantro and red pepper flakes. Once blended, whisk in water until you reach your desired consistency. Toss the soba noodles in the sesame-ginger sauce (depending on how saucy you like your noodles, you may have some sauce left over). Toss in the cucumber strips, scallions, sesame seeds and extra cilantro if desired. Season to taste with salt or additional tamari until the flavors really sing. Serve immediately. Suggested equipment: Two tools worth owning: a Microplane for finely grating ginger (and citrus zest, chocolate, and Parmesan), and a julienne peeler for slicing long strips of cucumber (and apples, shoestring potatoes, etc.). On leftovers: If your leftovers are watery, blame the cucumbers. Pour off some of the extra liquid and punch up the flavor with a light drizzle of sesame sauce and tamari/soy sauce. Leftover sesame-ginger sauce would make a light vegetable dip for carrots and bell pepper strips. 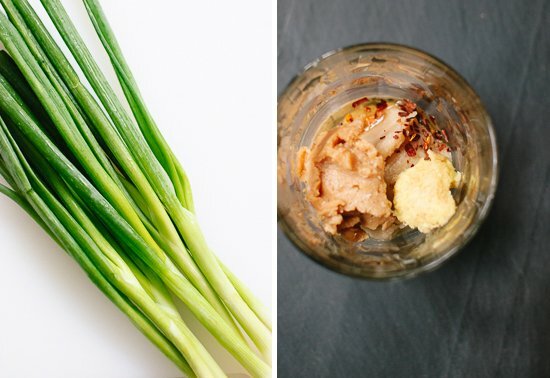 Freeze it: If you have leftover ginger, freeze it whole. When you’re ready to grate it for a dish, pull off a frozen chunk and grate it against a Microplane. No need to peel it, as the skin will stay on the top side of the Microplane. Change it up: Spice up this dish with chili garlic sauce or sriracha if you’d like. This looks so good! I have to make this, what a perfect quick and easy summer pasta! Nice idea, especially for this season but good anytime I’m sure. I would love to give this a try with some tahini dressing and ginger. Sounds like a great match! I literally eat cold soba noodles almost every week, and after reading this recipe, I’m never making them the old way ever again. You are an inspiration and I can’t wait to try these this weekend. Hope you all loved the noodles! Yes please! With temps in triple digits this weekend, I’d like to eat my weight in this salad. This looks very cooling and tasty for summer! I also love keeping bowls of leftovers in the fridge for the week. Something to look forward to each day! Can’t wait to try this! I’m kind of eating all day too. And with the heat this weekend, I could sure use a HUGE bowl of this, stat! This sounds and looks so delicious. I’m such a sucker for tahini dressing! I look forward to trying it out! Thanks! Looks and sounds so delicious. Thank you and I will make it soon. Thank you, Liz. Please let me know how it turns out! This sounds wonderful, Kathryne! I recently made a similar bowl with spiralized zucchini and shitaake mushrooms, but my favourite part was definitely the ginger sauce! I’m going to try your version next! Count me in. What time should I be there? Oh, I’ll bring the prosecco as a bribe. I LOVE soba. 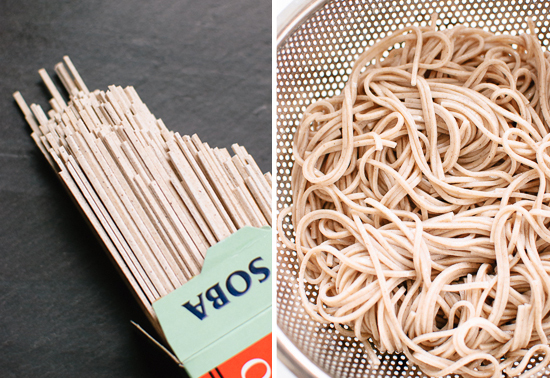 Cold soba noodles are the perfect weeknight summer dinner, and I can’t wait to try this one. That sesame tahini dressing alone! I could probably drink it straight. Thanks, Ruthy! Let me know how the noodles turn out! I am the same way with food! I love eating it all up before moving onto the next dish…and what better way to tell if it’s blogworthy than if I’m still craving it days later! I would totally crave these noodles, though, no question. It looks so delicious and it’s vegetarian! Thanks, Gunhild! Please do let me know how it turns out. I recently fell in love with soba noodles and have twice made them for a peanut-noodle salad. 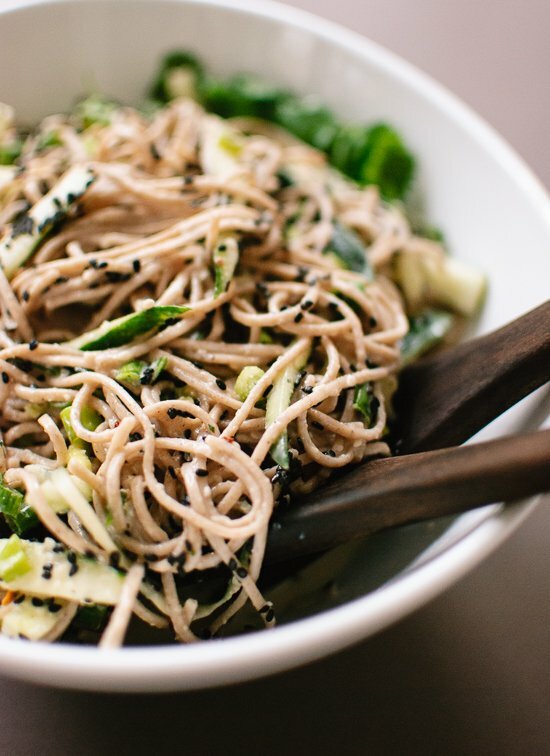 I love tahini, however, so will definitely try soba noodles with your sesame-ginger sauce! This meal looks so fresh and delicious. I’m usually only cooking for myself as well, so I really appreciate a meal that I can throw together and keep in the fridge for a few days. It’s no nice not to have to cook one night when you’re tired and stressed! Hear, hear! Bowl food is the best. Yummmmm…this dish has me instantly craving Japanese food. And I love the idea of making a tahini sauce! Thanks, Harriet! I love finding new uses for my favorite tahini sauce. Super looking dish. Soba noodles are such fun to eat- slurp-tastic! Especially with a yummy sauce like this one. Sadly I live with a ginger hater so I’ll have to save this one for when they’re not around. This looks spectacular, I love soba noodles! I really need to learn to eat like this when I’m busy! This has refreshing and summer written all over it!!! I bet this would be a huge hit at a summer BBQ because it is so not your typical pasta salad. Yum! Thanks, Kaleena! Hope you love the recipe! I just recently watched a video of three michelin star chef Alain Passard, in it he slightly cooks his cucumbers. I’m sure his technique would work wonders with this delicious recipe! Oh interesting! I wouldn’t have thought to cook cucumbers at all. I’ll have to find that video. This is such a fabulous summer dish! Yum! I’ll admit, most of the dishes I make at home are one-bowl dishes. Who has time to clean various pots and pans and when it’s 95 degrees outside – forget about it! This dish has everything I want in one bowl, perfect for summer, yum! One bowl dishes are the way to go! Thanks, Grace. What would be a good protein to pair with this dish? I was thinking some shrimp or scallops? I wanted a fish dish, but I don’t know what flavors would work with it. I’m sorry, Michelle, I wish I knew what to suggest! I’m guessing scallops would be nice, but I don’t eat much meat so it’s hard to say. I put half a can of tuna in (I also halved this recipe, I wanted to take it for lunch at work). I wouldn’t serve it to anyone for anything specia this way , but it made a nice, quick, and filling lunch for myself. Glad you enjoyed the noodles, Cait! Thanks, Dani! I’m so glad you enjoyed it. I’ve never seen black rice soba, but it sounds interesting! I’ll keep an eye out for it. Just wanted to let you know that I made this the other day and it was incredible! I added a few more veggies though (red pepper and shredded kale) just so it could be a main course. I can’t wait to make it again. Thanks, Nora! So glad you enjoyed it. I bet red pepper and kale are wonderful additions. This looks great and I love not turning the oven on in the summer! Can’t wait to give it a try. Thank you for the nice salad recipes. Have a great day. Thank you! Made this tonight- it was my first time using soba noodles and this was just great! Can’t wait to try more of your recipes! Thank you, Lisa! I’m so glad you enjoyed the noodles. I made this for dinner tonight (only change was I added more veggies) and it was incredible. :) Thanks for the inspiration! Kris, I’m so happy to hear it! Thank you for commenting to let me know. I made this the other night without the miso and I think that probably makes a big difference. I’ll have to keep my eyes peeled for miso. I might try this another night with some fried tofu or maybe a little peanut butter added to the sauce. Hi Kate! This recipe looks so good but I have one question- is it gluten free if there is soy sauce? I was led to believe soy sauce had gluten, but maybe I’m wrong…? Hey! Good question. I have a little note about that in my recipe summary but it is easy to miss. Tamari (a Japanese variety of soy sauce) is usually gluten free, but soy sauce isn’t. White miso is usually gluten free. 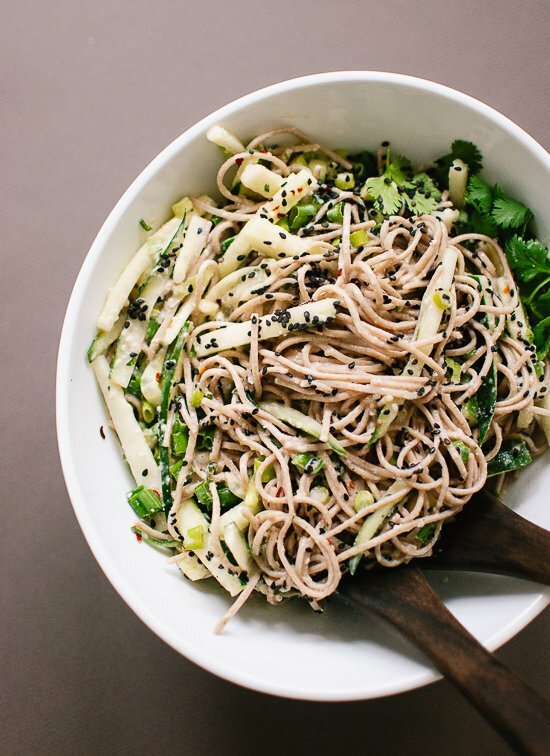 You would need to hunt down 100 percent buckwheat noodles for those to be gluten free. It should be pretty easy to find these ingredients at a well-stocked health store. Love this recipe and the pictures are really awesome! Was looking online for a recipe using soba noodles. Found this one, had all the ingredients on hand so gave it a try. Delicious and easy, too! Excited to try your other recipes – they all look great. Awesome, thanks Diane! Glad you enjoyed it. 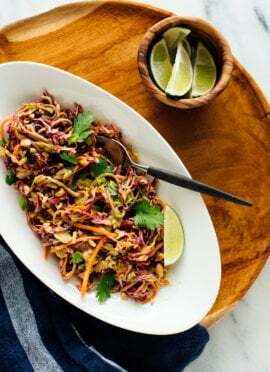 People are crazy about my peanut soba slaw. You might like that recipe, too! Made this for the fam tonight. All loved it. Thanks for another keeper! I added seasoned and cubed tofu… Perfect. Thanks! Thanks, Crystine! Glad you enjoyed the noodles! Thank you very much, Deborah! Glad to hear it! That sauce is AMAZING! So, so delicious. I made my noodles with sliced carrots instead of cucumbers because that’s all I had and threw in some sesame seeds, and they were so delicious. I will definitely be making this again (and again, and again)! I just made this tonight and it was a great hit for my tastebuds. I did not have tahini, so I substituted it with a tablespoon of peanut butter and some yogurt. Another option could be avocado instead of tahini, ideas ideas! For those questioning white miro or not, get the miso. It makes a huge difference and nice savory edge. Thank you very much, Lola! This was REALLY easy to put together and extremely delicious! It took me less than 15 mins. total including prep. I liked adding little amounts of the sauce first b/c the recipe is generous. Pinned! I just found your recipe last night (searching for soba noodle recipes) and made it. It was DELICIOUS! I also added the white miso and think it made a big difference. I’m going to try this with other veggies too. Thanks for an awesome recipe! I made the sesame-ginger soba noodles and they were delicious. I used a yam soba noodle, as I prefer these (when I can find them), I also used a Japanese cucumber and Japanese sesame paste (instead of tahini, not sure there is much difference, but we have a Japantown near us, so we can shop from there) . Since the noodles were a little sweeter, I had to add a little more low- sodium soy sauce. But the dish was perfect, and far exceeded another soba sauce recipe that we had been using from a very good vegan cookbook. You knocked this out of the park. Thanks. I just finished these for dinner and best thing sliced bread! It was my partners and first time ever having soba noodles and we loved them, everything complimented each other so well..we both wish we had another bowl! I love to prepare as much as possible in advance. Cab this be made earlier in the day? This post is 3 years old, but I’m just coming upon it now by way of Pinterest. The recipe looks great and I just bought some soba noodles last night, so I’m in business. I just want to comment one one thing: You mention a bunch of alternative preparations at the bottom, on of which is, “MAKE IT SOY FREE: Just use tamari in place of regular soy sauce”. I want everyone to know that TAMARI IS MADE FROM SOY. I’m not yelling, I just want this to stand out to anyone who looks through the posts. This is apparently a common misconception. I am not allergic to soy, but have a good friend that is. We were at a dinner and she asked if one dish was soy-free. The chef said no and she had an allergic reaction. At the end of the meal, we asked for the ingredients, and sure enough . . . there was tamari. I was appalled that the chef had no idea that tamari IS soy sauce; it is usually wheat-free, but certainly not soy-free. There are differences between the two sauces, but not having to do with soy. Yikes! You’re right. That note shouldn’t have been there. Thank you for pointing that out. It probably was supposed to be “make it gluten free,” but soba noodles aren’t gluten free, either. I just removed it. If I make this and bring to my friend’s house who lives an hour away, will it still be tasty? Hi Dani! I’d wait to toss the sauce with the cucumber and soba noodles until you get to your friend’s house. Otherwise, the cucumbers will start losing their moisture too soon. This is soooo delicious! And simple to make. I’ve made it three times in three weeks for guests. The only problem is, there’s never any left over! I don’t think I need to make a larger amount. I DO need to make some just for my husband and I to enjoy alone AND have some leftover! Yes, not having leftovers can be disappointing. But, happy they were such a hit! Thanks so much for the comment and review, Koriander. My boyfriend and I LOVE this recipe! Thanks for posting it! I love the flavor of this recipe which I tried for the first time after searching for the best soba salad recipe . However I decided to serve it cold on a hot summer evening and the texture changed to gloppy once chilled. Any idea how to keep it more slippery ( not sure that’s exactly the right word) when served cold? Hmmm… you could possibly reserve some of the sauce and add it in. When noodles are colder, they do tend to be more stiff and this is meant to be served warm. Possibly heat just enough to soften the noodles, or let come to room temperature before consuming right after making. I made this and it was a huge hit; now it is a highly requested dish in my home. The sauce is so darn good I make extra to add to just about anything. It seems like no matter how much I make it disappears within a day or two! Thanks! Happy to hear that, Garrett! This was delicious! I made this on a hot summer’s day (I’m in the Southern Hemisphere). I added a carrot, a red bell pepper and a boiled egg. I served it cold and it was “gloppy” like a previous reviewer mentioned, but delicious nonetheless. The leftovers tasted great the next day too. The sauce is a revelation! I’m glad you loved it! Thanks for the review.